Vintage Etched martini Cordials with Cobalt Blue Foot, Set of 4 3 oz Glasses. Preowned but in excellent condition please look at the pictures carefully any imperfections are due to factory made. Smoke and pet free home Shipped with USPS Priority Mail. This is a sweet set of 3 matching hand painted very vintage antique stemmed wine / martini / cocktail glasses ... these are in lovely useable vintage condition with minimal signs of wear with no chips, nicks or cracks. These measure 4 inches tall and 3 1/2 across the top. The are gilded on the top rim, in the middle and the rim of the foot with a 6 sided stem . I believe these could be DORFINGER but I’m not sure ..they are unmarked and either way they are completely lovely. Please refer to the pictures and thanks for looking. I see no obvious signs of wear or use. There are bubbles and blowing tails typical of glassware manufacture. I've included a close-up. EXCELLENT CONDITION. ORIGINAL OWNER. LOWER 48 ONLY. Mint condition & truly exquisite & special - unused. (Any spots are from water when I washed them by hand.). No international sales. Vintage Hotel Collection Crystal Martini Glasses (Lead Free, Mouth Blown). Sold in sets of 2. If you would like to buy more sets, please contact me. (There are a total of 12) Condition is New. Shipped with USPS Priority Mail. Each glass is optic glass and has beautiful etched flowers and leaves. Gorgeous etching! These glasses have a tall, smooth stem. Love the look of these glasses! Beautiful wide open bowl for all your favorite cocktails or martinis! Colors are: Peach, green, blue, dark olive and purple. These are light delicate glasses. (see pictures). Rim width: 3 1/4". Height: 5 3/8". A glass may have a few small bubbles. These are two Marquis by Waterford vintage 6" martini or cocktail glasses. They still have their original labels on them and are in mint condition!. Swizzle stick has ball at end broken off but this doesn't effect it's function. Classic CORA Golden Grapes Cocktail Set in Green & 22k Gold. Pattern: Golden Grapes. Set includes 8.5" Pitcher and 2 Coordinating Rocks Glasses. 3 pieces : Pitcher 2 glasses. These lovely cocktail/ martini glasses are from the 1960’s. Otherwise, the glasses are in very good condition. Local pickup is also available if you live in my area. All of my photos are of the actual item you will receive. Vintage Martini Glasses Crystal Ball Bottom Art Deco Style ~Set of Four. Condition is Used. Shipped with USPS Priority Mail Medium Flat Rate Box. Real Cool Looking Martini Glasses. This is a great set of glasses. One of the glasses is missing the silver rim. This is part of an estate sale. 2 VINTAGE MARQUIS WATERFORD CRYSTAL MARTINI GLASSES *NEW*. Condition is New. Shipped with USPS Priority Mail. great colours made in italy Shipped with USPS Priority Mail. Mini martini / wine glasses. Cut crystal optic floral. Etched base and decorative stem. and do not pretend to be. Waterford Marquis crystal “VINTAGE” pattern Pair of Martini Glasses. These were in production from 1997-2018. The 2 glasses are in perfect condition and were kept in a cabinet. They are 7 5/8” tall and 4 7/8” across. They are etched marked on the bottom as shown in the pictures. Great vehicle for a delicious and generous Martini or Cosmo! Shipped with USPS Priority Mail. 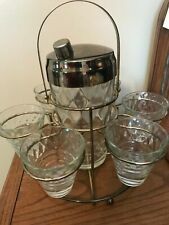 beautiful martini shaker with three glasses they all feature an etched Leaf design. These are very traditional shaped fine glasses.